The ViewSonic LS800HD is a laser-driven 1920x1080 projector rated at 5000 lumens and designed to perform in wide a range of environments -- from classrooms and auditoriums to retail shops, art galleries, and museums. 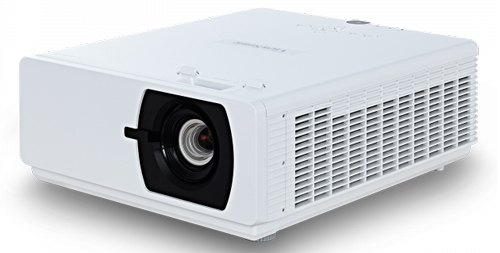 Its light output is relatively high for a 1080p laser projector that sells for $2999. Its laser phosphor light engine is specified to last for 30,000 hours of maintenance-free operation in Eco mode, while an HDBaseT input adds installation flexibility by letting you send HD video and control commands over Cat5e/Cat6 cable at distances up to 300 meters. Another feature that extends the LS800HD's range of installation options is its 360-degree orientation capability. The projector can be mounted at any angle, even firing straight down at the floor from a ceiling. It can also be mounted on its side to display images in portrait mode -- a common use in retail and trade show environments. A 1.65x zoom lens allows for image sizes ranging from 30 to 300 inches, and its lens shift controls permit 14.7% vertical and 5% horizontal adjustment. The LS800HD's ample light output also makes it a good candidate for use in home installations, especially for multipurpose media/living rooms where there's a relatively high ambient light level. Variable gain and cutoff settings in the projector's color temperature menu allow for precise grayscale calibration, and there are color management system settings to adjust color points, a process that requires proper measurement equipment to read values. The ViewSonic also supports 3D, a display format that strongly benefits from high brightness projection. Optional accessories for the LS800HD include ViewSonic's PGD-350 active 3D glasses ($65.99/each) and VC10 wireless display adapter ($129.99). The latter is a thumb drive-size adapter that plugs into an HDMI input on the projector and streams video via Wi-Fi, AirPlay, Miracast, and DLNA from computers and mobile devices. It also enables split-screen display for up to four separate presenters, along with a moderator mode for screen control. Presentations, spreadsheets, and other data images looked exceptionally clear, bright, and crisp on the LS800HD, with punchy contrast between fine black text and white backgrounds. Image focus also was excellent at all points across the screen, including the far corners. Photos had mostly natural color and good contrast in Photo mode, with pictures displaying a high level of detail and very little noise. The LS800HD's BrilliantColor feature is set to the highest level by default for all picture modes. While this setting lets the projector deliver images with maximum brightness, in practice it has a negative affect on color accuracy. When displaying video images in dim or dark environments, reducing BrilliantColor to a mid-level setting can provide a sufficiently bright image with better saturation and improved color point accuracy. 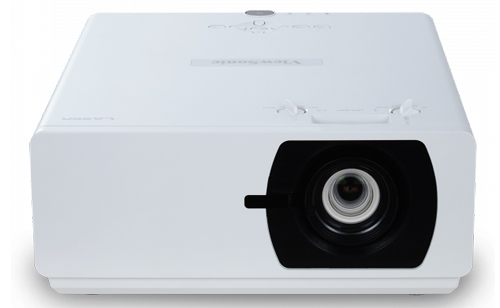 Picture contrast with the LS800HD is also good for a projector designed primarily for displaying data, though it comes nowhere near ViewSonic's 100,000:1 specification. Even in a best-case scenario, shadows come across as a dark gray as opposed to black when watching video content. Best contrast performance came with the projector in Movie mode with its Custom Light Source setting adjusted to 40% of maximum. At this setting, dark scenes in high-definition movies had a satisfying level of depth, and the highlights had sufficient degree of pop. For best contrast performance, video should be viewed in dim lighting, though an ambient light rejecting (ALR) screen can help boost contrast in brighter environments. While it's true that the BrilliantColor feature on DLP projectors should be turned off to get best color accuracy, doing so on the LS800HD resulted in a greater than 100% reduction in peak light output, a higher than normal amount. My final settings for the ViewSonic pegged BrilliantColor at the 6 setting. With the projector's Warm color temperature preset selected, images had an overly reddish cast, though the color balance could be significantly improved by adjusting the RGB gain and cutoff sliders in the color temperature menu. Brightness. ViewSonic rates the LS800HD's light output at 5000 lumens. After a 10-minute warmup cycle, measurements were made for each of the projector's picture modes at the Normal and Eco Light Source settings with BrilliantColor set to maximum and the zoom lens at its widest setting. Eco Mode. Selecting the projector's Eco Light Source setting resulted in a 20% overall light output reduction. The fan noise reduction with Eco selected was minimal, however -- only a few dB at best -- so the Normal Light Source setting can be safely selected for installations where greater picture brightness is preferred. Zoom Lens Light Loss. Moving the zoom to its telephoto end reduces lumen output by 20%, which is typical of zooms with a range of 1.65x. Color Brightness. The LS800HD's measured color brightness averaged 36% of its white brightness in all picture modes with BrilliantColor set to the highest level. Maximum color brightness was provided by the Standard color preset, which measured 50% of white brightness. For this reason, it will be a good choice for displaying color graphics in a high ambient light environment. The LS800HD's color brightness is about average for a DLP projector designed for data display. As stated above, adjusting the BrilliantColor feature to a mid-level setting can effectively increase color saturation while also providing sufficient brightness and contrast for video viewing in dim lighting conditions. Brightness Uniformity. The LS800HD's brightness uniformity measured a very solid 78% with measurements taken at the widest angle setting of its zoom lens. Although brightness variations could be seen when viewing full-field gray test patterns, these were much harder to detect when viewing still images or video with the projector, and I noticed no hotspotting when viewing a 100% white full-field test pattern. Black-and-white images also displayed excellent uniformity, with very little tonal variation or tinting from the center out to the edges of the screen. Fan Noise. Fan noise was relatively low with the LS800HD's Normal Light Source setting active, and it dropped by approximately 6dB with the projector set to Eco mode. Reducing light output in the Custom Light Source setting (I had it set to 40% for dark room viewing) will even further reduce fan noise, resulting in whisper-quiet operation from the projector. Input Lag. Input lag on the LS800HD measured 33.1 ms in all color modes. Lamp Life. The lifespan of the LS800HD's laser light engine is rated for 30,000 hours in Eco Light Source mode, and 20,000 hours in Normal mode. Those numbers are a significant improvement over lamp-based projectors, which typically require a lamp replacement after 2,000 to 5,000 hours. Warranty. The LS800HD comes with a 3-year warranty. The LS800HD's 1.65:1 zoom lens and vertical/horizontal lens shift adjustments permit a high level of placement flexibility in a classroom or home setting, while its 360-degree orientation and portrait display mode allow for an even greater range of installation options. The manual zoom adjustment located on the projector's top was difficult to adjust due to its recessed placement -- getting the picture to fill the screen during initial setup took a degree of effort. There are also keystone and corner adjustment settings for tweaking picture geometry, although both are digital controls that reduce picture resolution when used. At 6.3 x 14.2 x 17.3 inches (HWD) and 24.3 pounds, the LS800HD is too large and heavy for easy bookshelf placement, so you'll likely want to install it using a ceiling mount, or a rack or stand behind the seats built to support it. When used for video viewing, the LS800HD should be used with a progressive-scan source like a Blu-ray player or video scaler when possible. That's because there are no video processing modes that provide 3:2 pulldown for film-based images on DVD or broadcast TV programs, which may show "jaggy" picture artifacts. Connection Panel. Three HDMI 1.4a inputs are located on the projector's rear panel along with composite-video and HDBaseT connections, and a VGA port that doubles as a component-video input. There are also Type-A USB and mini USB ports, along with RS-232 and LAN connections for use with control systems including Crestron, AMX, and Control4. Minijack and stereo RCA audio inputs are provided, and there are VGA and minijack audio outputs. Lastly, there's a 3D sync port for connecting an IR emitter when the projector is used with ViewSonic's optional 3D glasses. Image Size. When used with a 16:9 screen, the LS800HD's image size range extends from 50 inches diagonal to 190 inches diagonal. The projector exhibits a 20% decrease in light output when adjusted from the widest angle setting of its zoom lens to maximum telephoto. Although that amount is a typical amount for a 1.65:1 zoom, you may want to consider installing the projector closer to the screen with the lens set near maximum wide angle to get a brighter image. Throw Distance. The LS800HD's 1.65:1 zoom lets you position it anywhere from 10 feet to 16.5 feet from a 120-inch screen. That's enough range to allow the projector to be mounted behind the main seating area in a typical medium-size media room. To check throw distance requirements for your desired screen size, see the ViewSonic LS800HD Projection Calculator. Video looks best in a dark room. Optimal picture adjustments for the LS800HD combined the Movie color mode with mid-range BrilliantColor and the Custom Light Source modes set to 40%. After calibration of both the projector's color temperature and color management settings, it delivered video images with accurate color and good contrast in a dark room. Viewing in higher ambient light settings required both an increase in BrilliantColor and a reset of the Light Source mode to Normal -- changes that resulted in a higher black level and a reduction of both contrast and color saturation. Audio. The projector's 2 x 5-watt onboard audio system had tinny sound quality and was barely sufficient to convey dialog in a clear manner. Using the LS800HD with an external audio system will be a much better option. Rainbow artifacts. I'm sensitive to rainbow artifacts and regularly see them when screening video content with DLP projectors, but rainbows didn't prove to be a serious issue with the LS800HD. Note that rainbow artifacts aren't a factor at all when displaying data and still photos with DLP projectors. The LS800HD is a versatile large venue DLP projector that can perform well in a range of installation environments. The LS800HD's laser light engine can be counted on for maintenance-free 24/7 operation up to 30,000 hours, and it delivers plenty of light output for classroom and conference room use. Spreadsheets, presentations, and still images all looked crisp, punchy, and detailed with its 1920x1080 display, which supports image sizes up to 300" diagonal. Beyond that, the LS800HD's vertical and horizontal lens shift, 360-degree orientation capability, portrait mode, and HDBaseT connectivity provide enhanced installation options that make it a good choice for retail and museum spaces as well. While designed for data display in high ambient light environments, the LS800HD is also be a good fit for dim and dark room video viewing. Using its custom color temperature and color management system adjustments, the projector can be calibrated for more accurate display of BT.709 color. Picture contrast is also mostly satisfying due to the projector's powerful light output. Ample picture brightness also makes it a good option for 3D display. 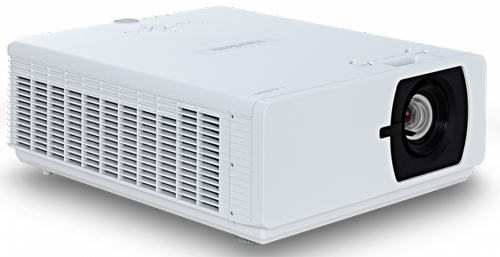 As the ViewSonic LS800HD offers a remarkably extensive array of features for $2999, it represents a solid value for a bright, 1920x1080-resolution DLP projector with a laser light engine. Whether used in conference room or a 3D home theater, there's a lot here to like.